Clamps and end caps to adjust the orientation of our O-120, O-210 and O-300 oval-shaped louvers. Each of these systems can be adapted to structural requirements that might be applicable at the installation site. 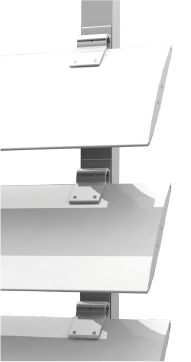 With the high degree of inclination that these accessories provide, you can vary the area of coverage of the slats, therefore changing the size of the projected shadow. 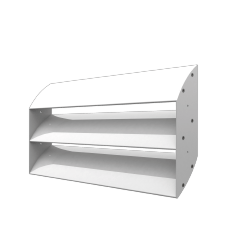 This is an accessory for the <strong>O-120, O-210 and O-300 </strong>oval-shaped louver models that enable installing the slats at different inclination angles. It can be fitted <strong>horizontally and vertically</strong>. This versatility enables better adaptability of the slats to any architectural style required. Aluminium end walls are installed on mechanised 65×65 and 100×40 tubes with the option of installing with supports in a vertical and horizontal (pergolas) position. They can also be combined with orientable slats at orientation angles from 15° to 65° to match any architectural requirement. 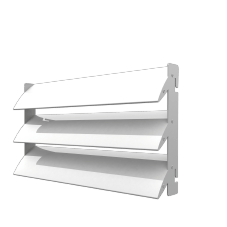 Caps designed to improve closure and adjustment of slats in O-120, O-210 and O-300 louvers, enabling higher quality surface lacquering. As they are manufactured in aluminium, their resistance to corrosion, once lacquered, is optimal. They are used to cap the sides of the slats of O-120, O-210 and O-300 louvers in a fixed position. 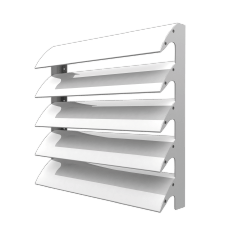 Multiple forms and orientations for slats of O-120, O-210 and O-300 louvers can be achieved with a fixed lateral support. Fixed sunlight protection, horizontal, vertical or inclined, can be achieved through forms tailor-made for each project. They are aluminium forms with a thickness calculated as a function of the weight of the slats and the wind load for each specific project. The maximum width of the slats will depend on the inclination, type of fixing and level of exposure.